Where will Brewer end up? Let us know! Ronnie Brewer is an intriguing prospect in this draft. Despite suffering a broke arm as a child that left him unable to fully extend his right elbow, Brewer followed in his father's footsteps by averaging 18.4 points on 44.1% shooting and 4.8 rebounds as a junior at Arkansas. 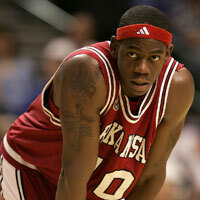 Brewer's father, Ron Brewer, was a star for the Razorbacks and played 8 seasons in the NBA from 1978-1986. Defensively, Brewer really shined, having picked 2.6 steals a game as both a sophomore and junior. Brewer has the potential to be a lockdown defender type in the pros, having picked 5 steals or more in 8 games as a junior. He's big, quick and versatile enough to possibly play 3 positions in the NBA. Very strong at getting to the rack. Brewer broke his arm badly as a child, which has left him unable to fully extend his right arm and his shooting mechanics are very bad as a result. Will this hurt him in the pros? His outside shot needs work -- shot under 34% from long range as a senior. Ronnie Brewer on the Houston Rockets? Tall, athletic, quick defenders who can shoot the ball are going to get strong looks from the Rockets. No doubt Jeff Van Gundy will be intrigued by the thought of adding Brewer to his defensive schemes, but will he be an effective scorer at this level? That's the question the Rockets will seek the answer to when they're deciding between guys like Rodney Carney and Ronnie Brewer.